Versatile, lightweight and durable. If you could describe Sterling’s Fiber Optic Splicing Capsule in three words, these would be them. 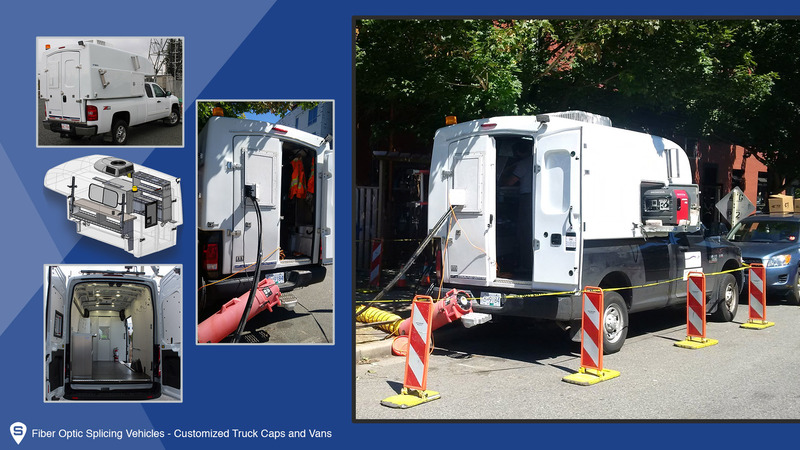 The slide-in service body is a turnkey solution designed as a mobile fiber splicing work shop. It’s the best option out there for technicians. If you’re looking to maximize efficiency while decreasing downtime this is the ultimate solution. Our Splicing Capsule is easily transferable between any domestic ¾ ton trucks. This includes Ford, Dodge or GM. The transfer takes roughly 20 minutes and you can switch it over even after upfitting the interior. With a capsule that will outlast a truck, it’s important to have the freedom to move it over to your next truck. Even if it is a different make. At only 1500 lbs once its full outfitted this cap can help you keep fuel costs down. Sterling’s slide-in service bodies are the only capsule that can be safely lifted from the inside ceiling using a forklift. Check it out in the video below. Both the weight and durability play a part in this. A lighter slip-in service body also means your truck is capable of hauling more. No need to ditch those heavy tools or select which ones you need for the day. Bring them all and keep them secure in your cap. Further, a lighter capsule will make your vehicle easier to maneuver on all terrain. Have you ever tried to take a corner with a top heavy load? If you have and you were lucky, there wasn’t an accident. However, for someone who may not be used to the route or driving with a capsule at all, this can yield tragic results. The fiber optic splicing cap is made from the toughest capsule on the market. It is the only cap made of a one piece fiberglass mold. This ensures that there is no weak points that will allow damage, leakage or condensation. The capsule also incorporates extra reinforcements throughout the interior. It’s the only capsule that you can install an A/C unit onto. If you’re a fiber optic splicer you know how detrimental it is to control the temperature around you. Not only does this keep you safe but it also maximizes your comfort. No matter the brand, if a fiberglass capsule is put under stress, it has the potential to warp. We know you need to be successful and that is why we have chosen a capsule brand that will hold up to your expectations. Now that we’ve skimmed the surface on the Fiber Optic Splicing Capsule, be sure to return next week to learn about even more features. We are committed to helping our customers get more done, whatever more means to you.